On an island in the river Dee in Dumfries and Galloway, historic Threave Castle stands as a visible link with a fascinating chapter of the Maxwell familys past. While not built by Maxwells, the tower was a Maxwell stronghold for more than a century after Lord Maxwell became heritable custodian of Threave in 1526. The castle remained in Maxwell hands until 1640 and has been unoccupied ever since. Today, it is maintained by Historic Scotland on the 1250 acre Threave Estate which is maintained by the Scottish Trust for Historic Preservation. 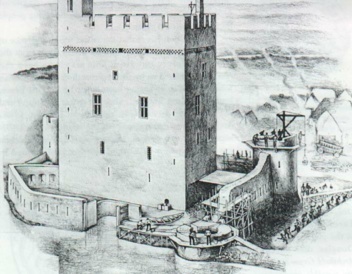 Threave Castles importance began long before it came into Maxwell hands. According to legend, its small island was the home of Galloways ancient rulers more than a thousand years ago. The tower house itself dates to 1369, when it was built for Archibald Douglas upon his becoming Lord of Galloway. Dubbed Archibald The Grim by the English whom he ejected from that corner of Scotland in 1384, Archibald was the third Earl of Douglas. Among the most powerful leaders in southern Scotland, he died on Christmas Eve in 1400. His son, the fourth Earl of Douglas, then lived in the castle until his own death in 1424 at the Battle of Verneuil where he fought for the French against the English. His widow, the former Princess Margaret Stewart, eldest daughter of Robert III, lived at Threave for another 25 years after his death, as did several later Douglases. By the middle of the 15th century, the eighth Earl of Douglas was at loggerheads with King James II, and the king began systematically destroying the power of that family. He began by personally murdering the Earl at Stirling Castle in 1452, and all the Douglas castles had been destroyed by 1455 except Threave. Capturing the tower was no easy task, and the king came to personally direct the two month siege. When the Douglases finally surrendered, it was not because of military might but because some defenders were bribed with money and land. The castle then became crown property, and it remained so until Lord Maxwell was declared its heritable custodian in 1526. Though the Maxwells chief seat was at Caerlaverock Castle in Nithsdale, Threave remained an important fortification for the Maxwells through a turbulent period, except for a brief time, the Rough Wooing of 1544-45, when it was held by the English. In 1639, Robert Maxwell, Earl of Nithsdale and Lord of Threave, supported King Charles I in his dispute with his subjects. This resulted in the Covenanters besieging the castle. Robert, with a small garrison of about 100, held out against vastly superior forces for thirteen weeks. Finally, in September of that year, King Charles sent a letter authorizing Robert Maxwell to surrender Threave Castle and walk free with honour. After that siege, orders were given to dismantle Threave so that it could never be used again. The roof and timbers were removed, and stone from the surrounding fortification was taken away to be used for building other homes, but a substantial part of the tower house and artillery fortifications still survive. Although the castle was never occupied again, it still stands as a reminder of its role in Maxwell history and in the history of other prominent Border families. The lands surrounding Threave Castle were purchased in 1867 by a successful Liverpool businessman, William Gordon, and the Gordon family bequeathed the estate to the National Trust for Scotland in the mid-1900s. The castle itself is in the care of Historic Scotland, and the National Trust of Scotland maintains the surrounding 1250 acres, including the 60-acre Threave Garden, a beautiful, diverse, and complete gardening center.